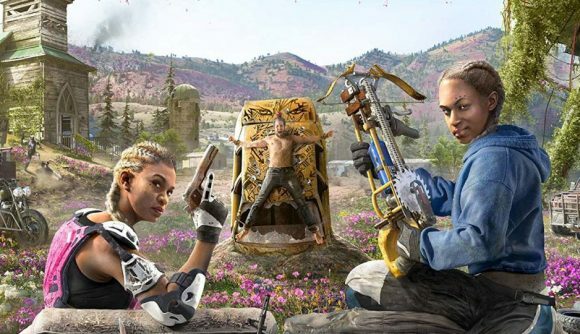 Rejoice, for the New Dawn is nearly upon us – Far Cry New Dawn, that is. Ubisoft’s futuristic take on a post-nuclear version of Montana releases tomorrow, but the scores are coming in already, so it’s time to find out what the critics thought of the spin-off. Julian’s score seems to match many of the other nuclear-hot takes from across the rest of the industry. At time of writing, it boasts a score of 72 on Opencritic. Sadly, there’s no official score just yet on MetaCritic, but I’m sure that average ratings will show up at some point later today. For the most part, it seems like this second trip to Hope County is decent, even if it doesn’t quite set the world on fire (unlike the nuclear apocalypse that forms its backdrop). If you enjoyed Far Cry 5, or you’re a fan of the series in general, it seems like you’ll have a good time, but if you’re not sure, it’s worth remembering that there are plenty of other takes on the post-apocalypse on their way soon.